In the early ’90s, when San Diego was sometimes called “the next Seattle,” the fiercely independent combo Trumans Water more than held its own in a scene overflowing with talent and promise. In 1994, that band relocated to Portland, Oregon. Its singer, Glen Galloway, remained in San Diego and started Soul-Junk, a project based on his devout Christian principles. As frantic and fractured as Trumans Water could seem, Galloway has found a lot of structure in his life. In his “day job,” he co-runs Singing Serpent, a company creating custom music and sound design, with his partner, Rafter Roberts. He is also a family man, with a wife and two kids, and the leader of Octa#grape, a group featuring Trumans drummer Ely Moyal, guitarist Jason Begin (a.k.a. 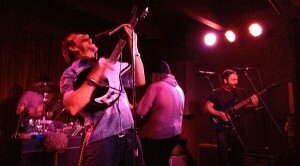 Vytear, Drifting), and former Olivelawn and fluf frontman Otis “O” Barthoulameu on bass. Whopperjaw recently picked Galloway’s fertile mind via email. What do you remember most about the Trumans Water days? Did you feel like the band was resistant (intentionally or otherwise) to the dominant paradigm at work in the greater rock community? Trumans Water was into doing its own thing. There was so much momentum and good community in underground music (and also specifically in San Diego) in the early ’90s, but to us it was about pushing each other further instead of blending in. We all grew up on punk and art-rock, and the way we saw it was there was a little window where mainstream culture wanted to dance…and it just felt like the dance should be led by new ideas. We just figured anyone who didn’t like it didn’t get it. Our music was for us. How would you describe your artistic development from Trumans Water to Soul-Junk to Octa#grape? Where does Singing Serpent fit in artistically? Soul-Junk was a wild departure for me. Trumans had become this thing where we played together constantly whether we were on tour or not. We were way more into improv than songwriting. We told everybody we wanted to write songs that sounded like they were total freeform, and improvise in a way where people thought it was written. I loved every part of it. Whether we were recording in our own garage or in the BBC, or playing in the states or in Europe, it was all completely on our own terms. We just figured anyone who didn’t like it didn’t get it. Our music was for us. Octa#grape started in late 2011 when I wrote six songs that didn’t seem to fit with Soul-Junk. They were simple with strong moody hooks, so I wrote weird abstract lyrics for them and started doing them as a solo thing for about six months. At first I liked the idea of a solo project, but after recording a few of the songs, I felt like they really needed a full band. I did a few shows as a 2-piece, and then in May 2012 all of a sudden we were a 4-piece. By September it was obvious the band had amazing chemistry, and the new songs have really formed around that. Now Singing Serpent is the best job I’ve ever had. There’s still a huge distance between music I write for my own bands and music people ask us to do for commercials. You do get used to a long approval process, and there’s a funny dynamic where when I’m working on my own music, I feel like I’m getting away with something. What’s the story behind the band name, Octa#grape? I did a collage with a weird bulbous octopus/squid creature a while ago. “Octa-grape” seemed like an obvious name for that, and it’s what this band makes me think of—dark fruit bulbs with long squishing tentacles. To the outside observer, it looks like you have many irons in the fire, personally, professionally and creatively. What’s the best way you’ve found to maintain balance in your life? Doing gospel music (with Soul-Junk and at church) makes me very transparent. There’s no way for me to be any bit fake or tired and pull that off. Either the connection between me and God is undeniable, or I need to sit down quickly. I’ve been very close to God for most of my life (regardless of music), but years of depending on God to take something that’s very private and make it translate publicly keeps me centered. That and I take my longboard out in very cold water almost every morning. How would you say that categorizations such as “indie rock,” “Christian rock,” and “commercial success” have changed, both in general and for you personally? My two labels are “I feel it,” or “I don’t.” After years of having wild allergic reactions towards any music labeling, I realize that I’m a freak and am just always trying to find stuff that defies categorization. How do you approach songwriting versus writing music for television commercials? Or is Singing Serpent not so much writing music as sound design? At this point I’m doing way more work directly with agencies, and not much actual music-making for TV. I speak up whenever I hear an idea in a track, but I defer to the guys producing the music. We all know my mainstream pop chops are far from world-class. What is the current status of Soul-Junk? It’s me, two of my brothers (Jon on bass and Brian on guitar), and my two kids (Jude on drums and Mila on keys/percussion). We got a chance to play at the Orpheum this month, so we’ve been playing together a lot. We worked on three albums in 2011, singing through the Psalms. One of those albums (1961) got released on Sounds Familyre, and the other two are getting mixed. When did you start Thing Thing Thing Records? What’s new with the label? Any upcoming projects? Rafter has done an amazing job on that label. We came up with the idea of pulling bands in for a day or two and recording a 7″ with them, and all of a sudden Rafter had sessions set up with And And And (Portland), Death Songs (Boise), and The Donkeys (San Diego). Since then we’ve done several more sessions, including Crumbs (Olympia) and Octa#grape (recorded by Jason Begin on 4-track). A couple of those bands have come back to record full-lengths, but we’re not releasing those. We’re just in it for the singles. The more we release, the easier it is to convince other bands we love to come record with us for a day or two.